In mathematics, the greatest common divisor (GCD) of two or more integers, when at least one of them is not zero, is the largest positive integer that divides the numbers without a remainder. For example, the GCD of 20 and 25 is 5. Please share your feedback for improvement of this code. The best way to learn a new computer language is by solving puzzles, games & code challenges. It's so much fun apart from the satisfaction you get once you crack them! Solving puzzles can push your language skills to the next level apart from improving your problem solving skills. From my experience I can tell you that in the beginning they're in fact a tough-nut-to-crack but once you persist enough to solve a few of them... it's kinda addictive! Start with the simple ones... and don't quit! Play with the code and see the results in your browser - Once this page is open, click run and follow the instructions. In this post we'll see how to find if an input string is a palindrome or not using Golang. A palindrome is a word, phrase, number, or other sequence of characters which reads the same backward or forward. 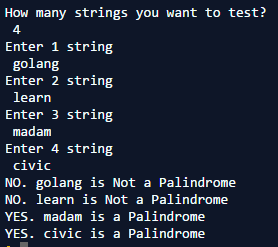 Enter a string and find out if the string is a Palindrome or not. Play with the above code. Now let us build an advanced version of the problem where we can see a practical usage of Slices. Enter fixed number of strings, each in a new line, and find out if they are palindrome or not. To understand this solution you must have working knowledge of Slices in Go Programming. return "NO. " + s + " is Not a Palindrome"
return "YES. " + s + " is a Palindrome"
To take care of the null/empty input strings. To return appropriate message if number of strings to test is entered zero.